What Can You Do to Help a Senior Who Is Afraid of Falling? 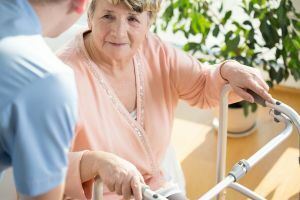 Homecare Covington TN – What Can You Do to Help a Senior Who Is Afraid of Falling? Falls are a much bigger problem than you might realize. For an aging adult, a fall could mean serious injury that is a huge factor for the rest of her life. Helping your elderly family member get over her fear of falling could help her to avoid one. If your senior mentions she’s afraid of falling or even if you only suspect that she has this fear, talk with her about it. During your talk, do what you can to get to the root of the matter. If she feels unsafe because her home needs repairs, start making a list. If she feels unsafe because she’s alone a lot, hiring homecare providers can be the answer you need. Whatever your elderly family member needs to feel safer should definitely be assessed further. Sometimes home modifications are the step you need to take. Tripping hazards and obstacles that are out of place need to go. Lighting needs to be sufficient that your senior can safely see where she’s going, even during the day if the extra lighting helps. Hand rails and grab bars can help to provide stability and balance when she’s feeling unsafe. Improving your aging adult’s physical well-being can be a key component of helping her to avoid a fall. If she hasn’t exercised in a long time, it might be the right time to start. Talk with her doctor about setting up the right exercise plan and then gradually ease into it. Make sure that she’s eating foods which help her to stay as healthy as possible and that offer her plenty of nutrients. It’s always possible that your senior has all of the right safety accommodations in place and she’s still afraid of falling. You might want to consider finding a therapist or counselor that she feels comfortable with so that she can talk through her fear. Very often fear is not logical or rational and that means that finding another way to address the situation is crucial. If your elderly family member lets you know that she’s afraid of falling, take her fears seriously. Continuing to be afraid of a fall can make the situation much worse for your senior family member. In fact, she may even fall simply because it’s what she fears the most right now. It’s worth the time and the effort to find solutions. For Homecare Services in Covington TN, please contact the caring staff at Personal Care Services MidSouth today! This entry was posted in Homecare Covington TN, Safety at Home and tagged Homecare Covington TN. Bookmark the permalink.